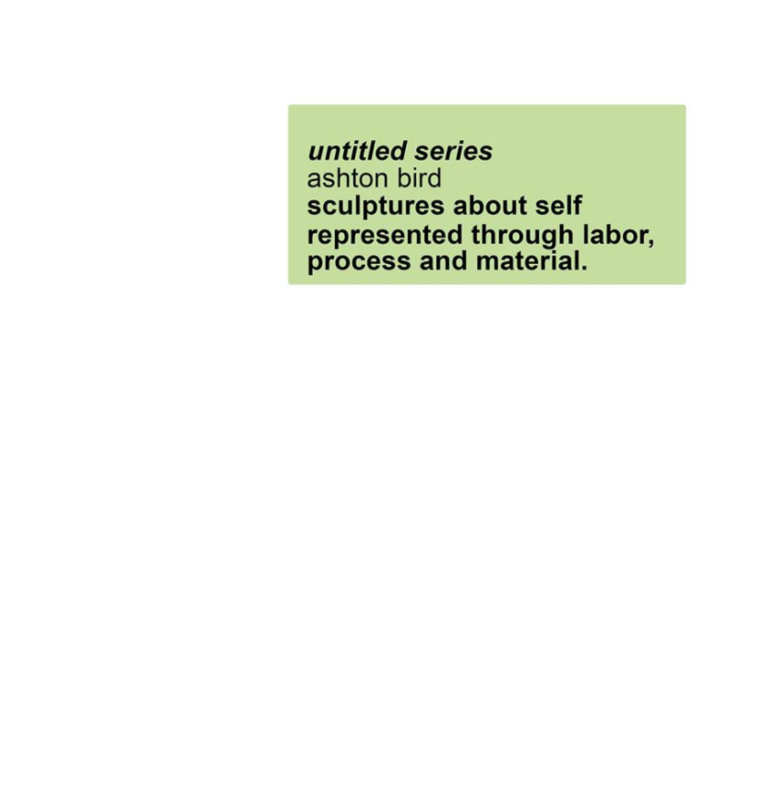 FSU Art MFA ’18 Ashton Bird is installing at the Carnaghi Arts Building, and all are cordially invited! Bird’s Untitled Series will show on June 23rd at 7:00PM and again on June 24th from 11:00AM to 2:00PM. Bird’s work manipulates discarded materials such as lumber, wood, tile, clay, concrete and cloth to create large sculptures and site-specific installations. Both sculptures and installations often have temporary life-spans with the materials being constructed, the structure documented, taken apart then re-invented in new a form. The renditions are often intuitively made based on marks and nicks left from the previous form. The details on the material remind him of specific, random or hypothetical experiences where the emotions related fuel the decisions made during the composition of the artwork. Working intuitively requires that remaining aware of emotional responses triggered by material associations connected to marks, imperfections and other records of human contact particular to the item. In order for the work to be resolved, Bird works quickly to capture the fleeting moment. The title of each rendition is equally important. It acts as a partition between ideas, and declares a stopping point before the take down then construction of the next thought. His sculptures and installations are raw, capture a pace, yet appear honest and vulnerable. The work does not hide his fabrication and emphasizes the gestures or labor involved in the process of making. Ashton Bird is an installation artist and mixed media printmaker. He was raised outside of Vermillion, South Dakota. While he was a kid, he passed most of his time nailing or whittling strange objects out of wood and thrown out tractor equipment. An odd hobby, yes but who would have thought the obvious foreshadowing would have led to his actions today –anyway- much of these creations can still be found around his family’s farm. In high school, he received several creative awards, graduated and enrolled at Minnesota State University-Mankato where he obtained his BFA in Studio Art with concentrations in ceramics and printmaking. As an exhibiting artist, Bird has shown work in Minnesota, South Dakota, Ohio, Florida, Washington D.C and Seoul, South Korea. In 2015, he was awarded the Artist Career Development Grant from the South Dakota Arts Council and a full-tuition scholarship from the highly-reputable Florida State University Master of Fine Arts program located in Tallahassee. In February of 2016, Ashton founded the contemporary arts gallery SOUP experimental and continues to expand his personal definition as a creator and artist. After graduating in 2018, Ashton will further push himself in his creative endeavors as both a working artist and gallery director.